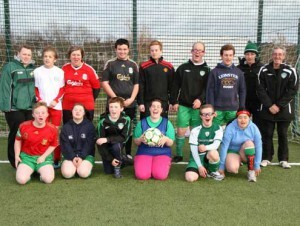 As a community club, Cabinteely is keen to ensure that football is open to all local children and adults, regardless of ability. To this end, the club is one of the few in Ireland fully involved with the FAI’s Football For All Club Programme and it works with both Special Olympics Ireland and Enable Ireland to ensure that we’re open to the broadest possible audience. Our Cougars’ and Pumas’ sessions run between 12.00 noon and 1.00pm every Saturday, on our all-weather pitch (pitch 12), and follow the regular fun skills, drills, shooting sessions and mini-match approach as all club players do. Our Cougars special needs programme has been operating successfully since 2006 and now has 20 players turning out every Saturday. Players of all ages are eligible if they have a learning disability which can be verified by a psychologist’s report. We currently have men’s and ladies’ squads which play in the regular day-long blitzes in the Dublin area and in a very successful special needs section in our annual summer Mini World Cup extravaganza, held in June every year. The latter is, of course, an open event so many non club members and other clubs also joined in the fun. 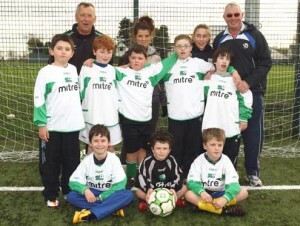 Our Football For All Pumas programme began in 2011 and caters for children of a wide range of ability – ranging from mild to moderate in various disabilities such as Cerebral Palsy. This group now has twelve members, a number which continues to grow and which promises to absorb all the coaching and assistance that the club can provide. It’s really evident to all coaches and helpers that these enthusiastic players have made remarkable progress and now won’t miss their Saturday sessions, no matter what the weather (which is often inclement, being Ireland!). Players and teams are organised by ability, rather than purely age, using a process called ‘divisioning’. This could mean having a 12-year-old playing on the same side as a 15-year-old or 18-year-old of the same ability. This is one area among many in which we will need to rely on the Special Olympics and Enable Ireland expertise. We’d be delighted if you would give Tommy Flynn (087 271 7475) or Jim Allen (086 063 0605) a call if you’re interested in getting involved in these programmes, whether as a player or as a volunteer coach/helper. The volunteers would be helping out in the same way as those who help with the Cubs and Kittens on Saturday mornings. They may also accompany the teams to the regular monthly Dublin region 5-a-side blitzes, where they will see the real fruits of their contributions. Some of our volunteer helpers go on to take up and follow the club standard coaching development pathway, including FAI coaching qualifications, so that they may contribute even more to the development of the players – all of them special in one way or another.